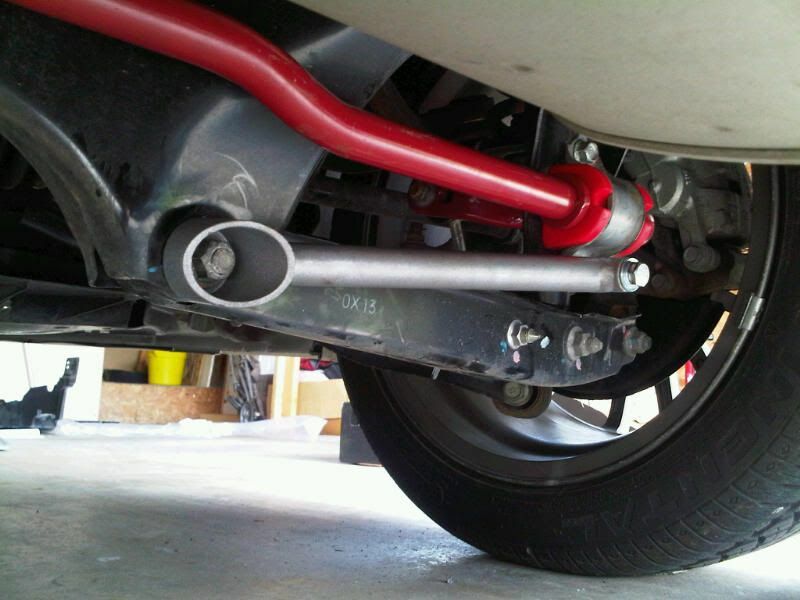 I upgraded the rear swaybars fairly early in my ownership of the WRX, as I found the body roll to be somewhat unsettling in spirited driving. 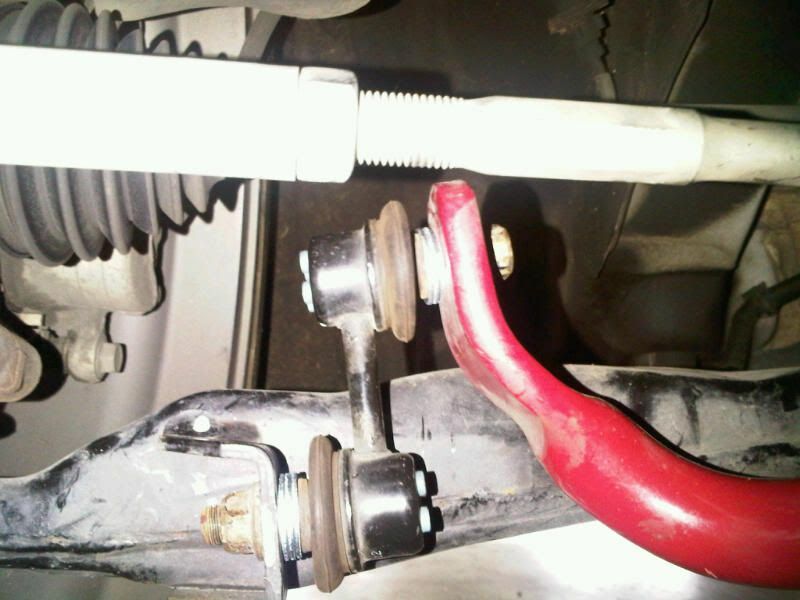 For cost and convenience, I selected the Eibach swaybar set. This set was designed for the 2008-2013 STi, but the 2011-2013 WRX uses the wider front bar from the STi, as opposed to the slightly more narrow bar from the 2008-2010 WRX. In truth, you can run either one in the front of the WRX, and it may be that the front baf from 2008-2010 might actually give better endlink angles, but the “correct” setup for the 2011-13 WRX is the same as the 2008-2013 STi. I do about 100 miles of commuting a day, with about 15 miles of it being similar to driving Summit Point’s main circuit. I also plan to autoX about 4-6 times a year, at least for now. No likelihood of real track time in the forseeable future. While I might upgrade the endlinks later, for now I will be on stock endlinks. Car is on stock suspension, and I run Continental A/S tires on the stock wheels due to the changing weather in my region and the location of my work (top of a mountain). I have no plans (currently) to do suspension modifications beyond sway bars. That being said, I wanted something that would control body roll in corners for daily use and occasional AutoX days, but is still quiet on daily drives. 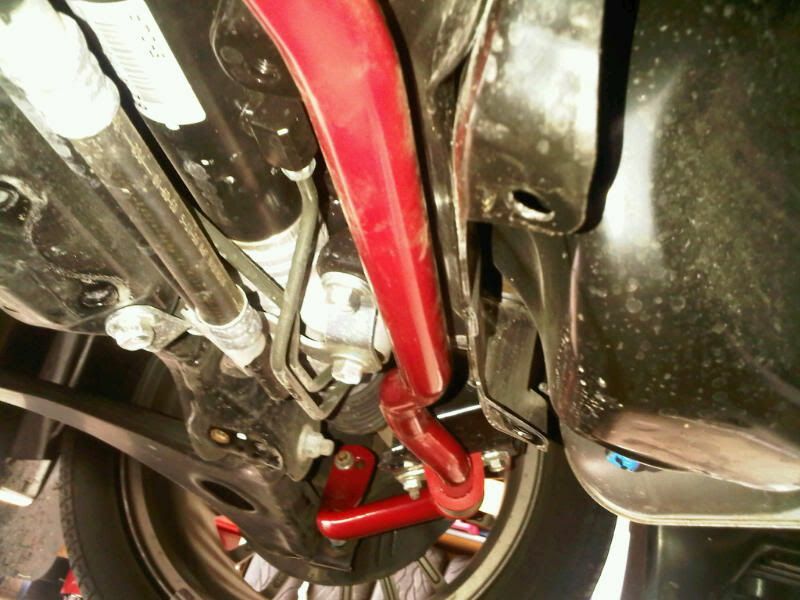 Before purchasing the Eibach kit, I had been looking at Rallitek (street) and Whiteline adjustable swaybars for my ’11 5DR. Between these 2 options, the cost differential was very minimal. 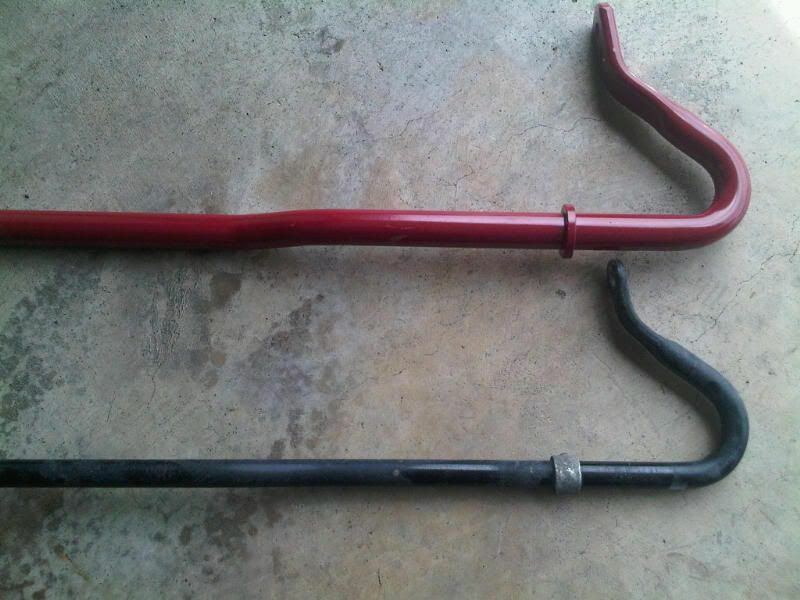 After some research, I found the Eibach bars that JSC Speed (www.jscspeed.com) sells. I found that there were few references to the Eibach kit, despite Eibach having a (generally) good reputation and despite the relatively low price and favorable specifications. The bars were initially listed at 25mm fixed front, 22mm adjustable rear, but tubular. In reality, both the front and rear have 2 adjustment settings. The Eibachs were considerably cheaper than the other options, but there were no real in-depth reviews, either. I decided to roll the dice and try them out. The 7718.320 kit was designed for the 08-10 STi, but after researching on here and other sites, I determined that the 08-10 STi front bar should be the correct fit for the ’11 WRX. The rear bar remained unchanged from the WRX to the STi, of course. They include replacement bushings, bushing lubricant, and detailed (enough) instructions. 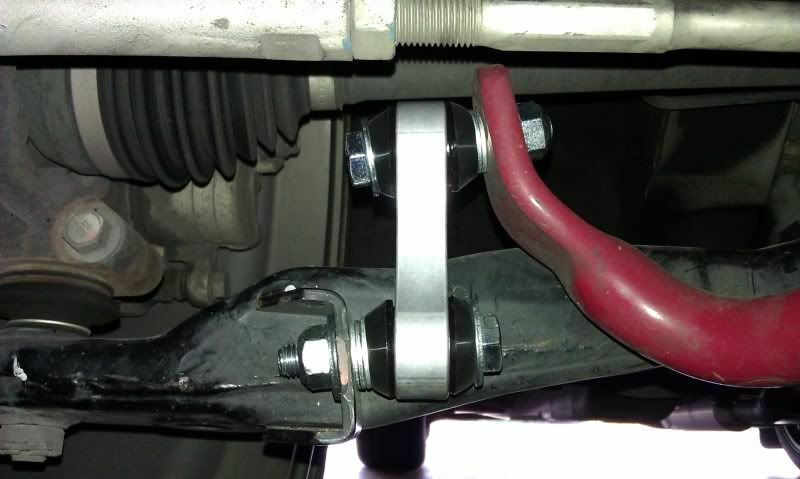 I also ordered the Whiteline Rear Swaybar Support Brace (KBR15), which was also not “officially” listed at the time as fitting the 2011, but there was no real question as to the compatibility of the KBR15. Parts arrived quickly, were packed appropriately, tracking info was provided promptly, and my invoicing was accurate. My only “complaint” at all was that upon opening the box, I could not find the endlinks that were pictured on the website. 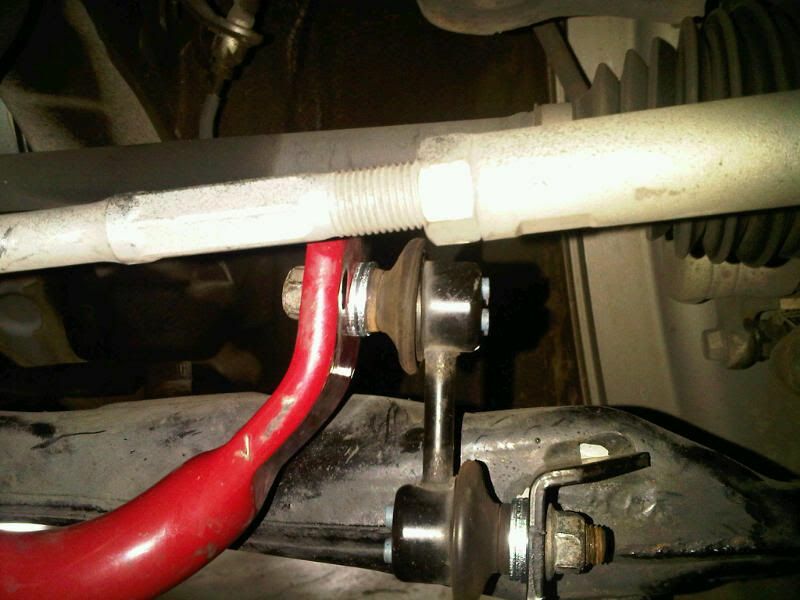 A quick call to JSC Speed and Eibach confirmed that that the JSC photo was just a stock photo of a generic F&R swaybar kit, and the description on Eibach’s website clearly excludes endlinks. No big deal- the savings on the kit as a whole was still great enough to more than cover endlinks at a later date, and it isn’t like I got screwed out of something that was promised to me. The bars themselves were fairly heavy- so heavy that they seemed like they might be solid. Instead, they were just very thick-walled hollow tubing. The bars weighed 8 lb. and 5 lb, F&R. The finish on the bars was good. 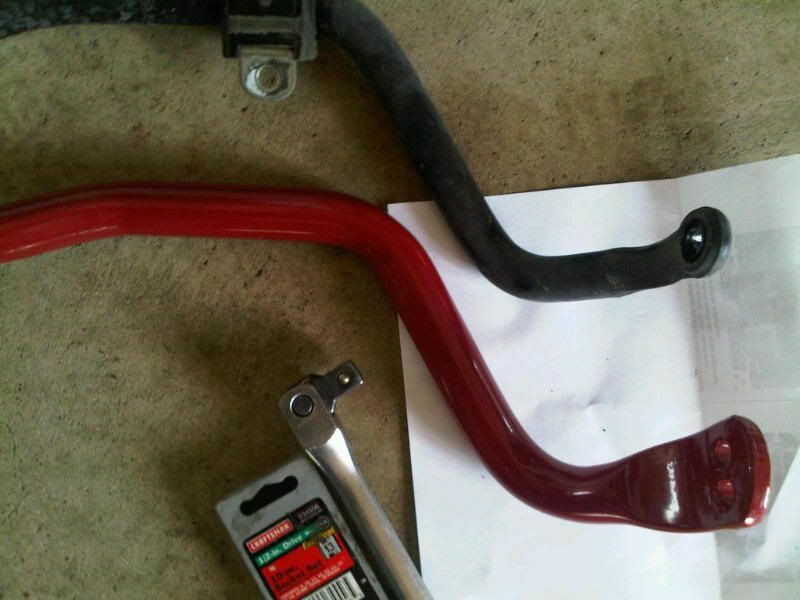 The paint or powdercoating was thick and uniform, and even my oafish handling of the bars during install did not screath through the paint. Fit was nearly perfect. The only reason that I say nearly was that the rear endlinks are pushed into a really extreme angle. 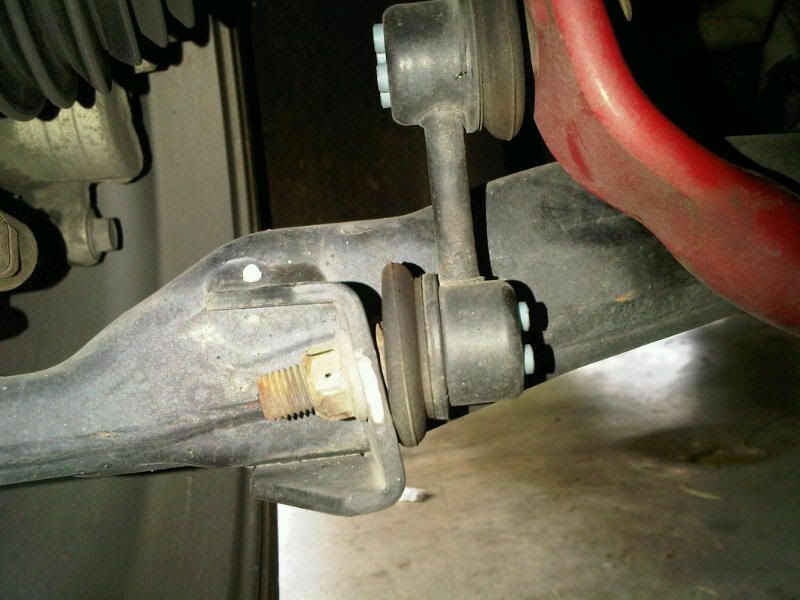 I confirmed with Eibach that this was normal, and they described the resting endlink angle as being right where mine were, so I feel confident that I have it correct. Oddly, the printing (part number, Eibach branding) on the rear bar was upside down when the bar was installed properly. 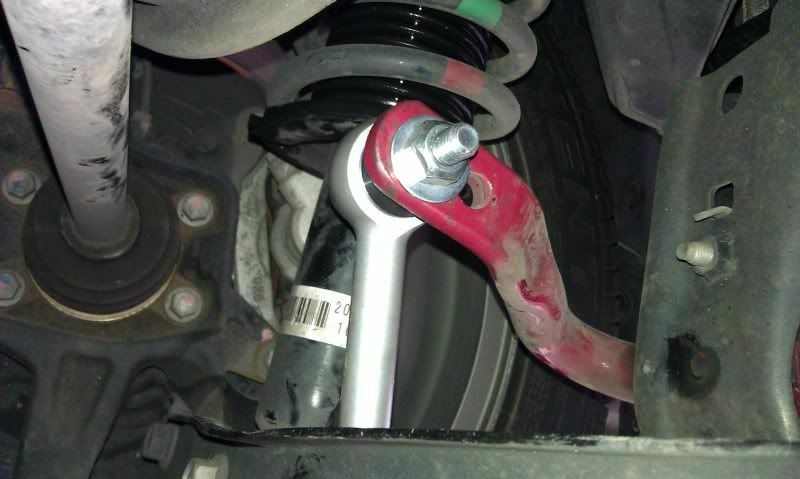 Eibach tech support confirmed that the “hump” in the rear bar should face up, and when installed that way, the writing was upside down. I had not paid attentio to how I removed the stock bar, so when I installed the new one with writing right-side up, it hit the exhaust. I called tech support and they got me squared away. The front bar went in with absolutely no issues. The only real headach in the install was the fact that when I went to install the KBR15 braces, the 17mm nut was on there REALLY tight. It took some real work to get it loosened. Anyway, the bars fit great and seem to be a great value for the cost. At under $300 for the pair, these are a great way to go for someone wanting adjustability, good street manners, and reduced body roll. I’ll post up more below about driving impressions later. So I got the car out and busted a couple of quick figure 8s in a cul de sac in my development, then drove it on a twisty 8 mile loop with plenty of elevation changes. I take this road 3x a week to pick up my son from the sitter, so I am pretty familiar with it. My immediate impression was that it was quiet. 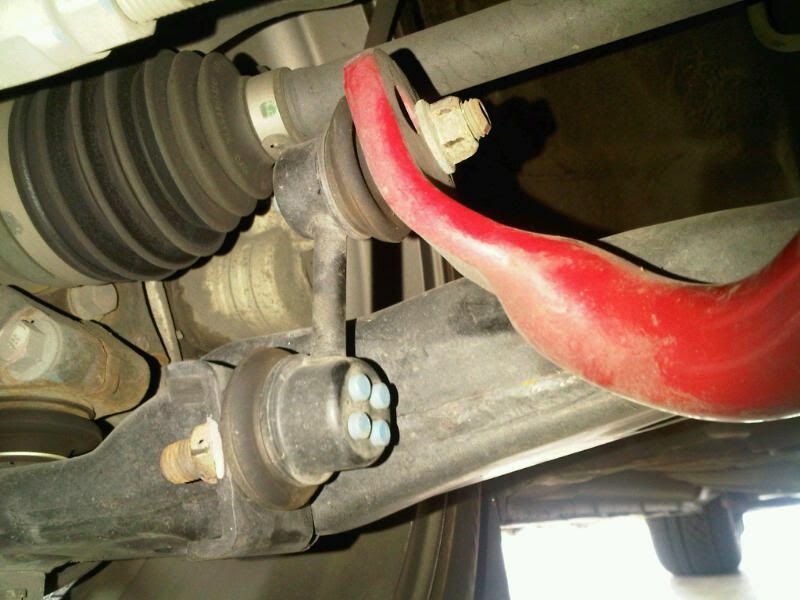 There was no difference in noise between these and the stock bars, so essentially nothing from the suspension in terms of noise. It seemed to have less roll, particularly from the rear. The front has not really been tested, but I can say that on the figure 8s, the rear end seemed to stay planted better than when I have to make a short U turn or turn around in a parking lot. On the road, the car definately had a little less lean in the rear, even under moderate driving. I have not really had the chance to see of it impacted the nose-dive factor in turns, but the next time I get on a good road without kids in the car, I will be giving that a shot. I’ll report back those results, but I can’t imagine that upping to the 25mm front bar could NOT have an impact on the tendency for the nose to lean in hard turns, particularly when braking. Not the impact that good springs would have on pitch, but some reduction in the 45* dip that happens in decellerating turns. After about 60 miles of driving, the setup remains quiet, which is a good sign. I’ll probably re-torque things in a couple of weeks, but if it stays quiet, this was clearly money well-spent. After that, I decided to upgrade to Kartboy endlins. 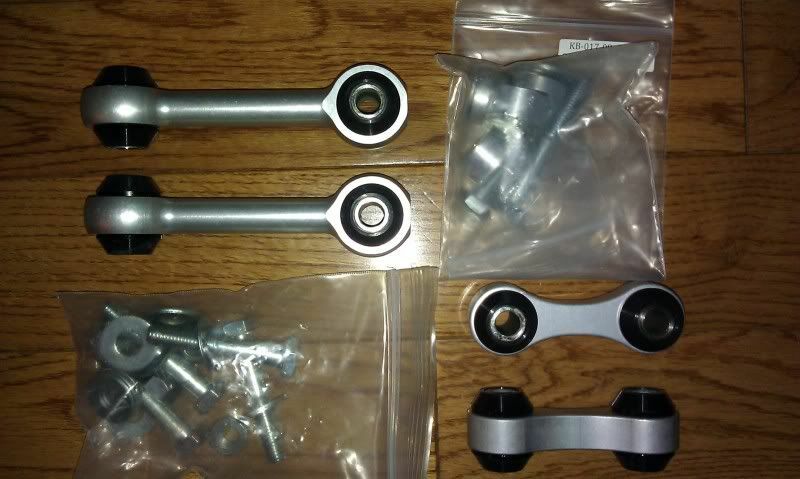 These were purchased from IAG (www.iagperformance.com) and cost in the neighborhood of $200. The reason for the Kartboy over other models (primarily Rallitek) was availability, and the cost/benefit on the Kartboy was better then many other available brands. It was also beneficial to have the ability to use traditional wrenches as opposed to Allen head wrenches to tighten them down. I am still not thrilled with the endlink angles, but I have not had the opportunity to really get in there and mess with them.